Re-usable – more expensive but everlasting. In the world at large (USA) the disposable F.U.D. has been around since the late 1990s. In the UK the most popular brand is the Netherlands-made P-Mate, a water-proof waxed cardboard funnel that is popped into shape from a flat pack when needed. The unique SheWee-inal® (named in acknowledgement of support from British-owned company, SheWee Ltd), is made by "Bob's Radio Know-how". 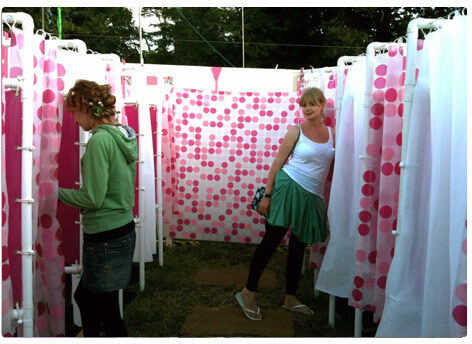 Installed inside a women-only enclosure, and with individual privacy partitions, it constitutes a She-pee, a concept that has emerged from the larger music festivals on the Isle of Wight and at Glastonbury since 2004. With due adjustments, the She-pee is sexual equality's answer to the ubiquitous male urinal. The provision of this alternative to the cabin-style mobile WC has offered women parity with males, for whom a nearby urinal is deriggeur. Women find it easy to use with the aid of a female urination device (F.U.D. ), a discreet, roughly conical funnel. Re-usable plastic F.U.D. are marketed by SheWee Ltd, Travel Mate, Urinette, and others, whilst there are several other brands of disposable waxed cardboard F.U.D., e.g. the popular P-Mate distributed by Joe Product Promotions Ltd. In 2004, the apparatus made a splash when it was distributed for use at She-pees, or female urinals, at music festivals in Britain and Australia. The inventions were hailed by upstanding women as an easy, sanitary solution at outdoor events in place of conventional public toilets. The equipment also let women realise their dreams of going to the toilet as swiftly as men. All users have to do is slip the P-Mate through trouser zippers or under skirts, hold it in place, and go with the flow. Although disposable, they can be used several times. Aside from convenience, P-Mates offer an option to women who don't like to hover above dirty public toilet seats. Rudimentary toilets in Indonesia inspired Dutch traveller Moon Zijp to create and patent the P-Mate when she returned to Amsterdam. After a flamboyant demonstration on Dutch television in 1999, the device caught on in Europe; millions have now been sold. On the Internet, the P-Mate has been praised, ridiculed and proclaimed as the ultimate in equal gender rights. "Now the fight back of women in the world of equal rights has surely reached its zenith," the Web site <www.shiola.co.uk> once proclaimed. "The goal was not to get equal salaries, votes, rights, privileges (sic) or even respect – the goal was to pee standing up." An alternative disposable F.U.D. is the heavy-paper Whizzy on the market in the USA. The SheWee is an exemplar of the environmentally friendly F.U.D. For not only is the target She-pee eco-friendly in its own right but using it with an eco-friendly F.U.D. completes an ecologically responsible systematic approach. Although in its infancy, that approach is being pioneered in other countries, e.g. the drier Mid-West states of the USA, and in Denmark where human urine is actively being harvested as an agri-chemical resource. Encouraging women to pee using a urinal lessens the direct consumption of water - a typical WC flushes away over a gallon of purified drinking water. Whilst the She-pee concept is good news from the point of view of water-conservation there remains the question as to whether the need for a F.U.D. itself is eco-friendly. It is well documented that women can learn to do without a F.U.D. but in practice the F.U.D. has been and will continue to be the catalyst for making the switch from WC to urinal. The disposable F.U.D. raises the issue of paper and fibre recycling, the discarded product probably being wet and none too pleasant to handle. Whilst no fault of the makers, problems of littering at some pop festivals have been reported. As well as working out cheaper to own, the re-usable F.U.D. consumes far less energy and fibre in its lifetime than the disposable counterpart. The SheWee is the UK's own environmentally friendly F.U.D. The MacMillan English Dictionary Resource Site offers the following journalistic etymology for the increasingly confused terms: “She-Pee” also “Shee-Pee” noun - a tent containing urinals (open toilets which are usually fixed to a wall), designed specifically for use by women at open-air events. She-pee is of course a play on the word tepee (also spelt teepee), a tall round tent made of animal skin and traditionally lived in by some native Americans. The She-pee was first launched at the Glastonbury music festival in 2004, notorious for many years for its less-than-desirable sanitary facilities. Its earlier fears allayed, Mendip District Council commended the debut of the Glastonbury She-pee, joining the chorus of glowing reports that have come out of successive seasons of summer music festivals. One applauded the fact that female visitors to Glastonbury and similar events no longer have to stand in long queues with their legs crossed, thanks to the revolutionary new She-pee, an invention which redresses that male-female imbalance where convenience for relieving oneself is concerned. Considered a successful innovation, it then made its way across the globe to Australia, where in January 2005 it was introduced by the organisers of the Big Day Out festival in Melbourne. Before going into detail about its various spellings and renderings, it is worth noting that the specific term SHE PEE is a Registered Trade Mark (She Pee™) belonging to Samantha Fountain MD of SheWee Ltd, Surrey, UK (She Pee™) (Registration Number 2397211)) Strictly it refers to a re-usable F.U.D. not a urinal enclosure. Hence the term, “She Pee” strictly does not belong in the set of alternative names: She/Pee; She-Pee; She-pee; Shee-Pee, Shee Pee; etc. To avoid further confusion, yet deferring to popular parlance, the exact term “She-pee” has be taken to refer to the enclosure (only) in this article. Urinals for women have been around since at least the 1950s, after leading toilet producer American Standard introduced the Sanistand, a women's urinal. It wasn't popular with restroom designers and more recent versions by other companies have not caught on. 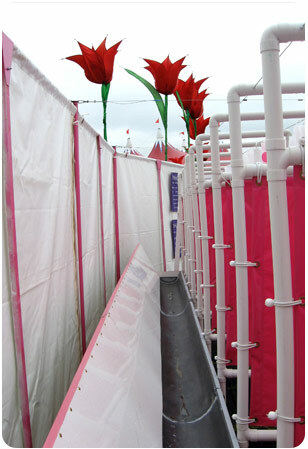 Glastonbury has used a mixture of traditional trough urinals and Dutch-made “WC3” (or “Kros”). The latter combines the urine tank with four low platforms at the four corners of an integrated 4-man unit in moulded plastic. Self-contained and immediately available, the “Kros” lends itself to being hoisted into position from a truck. It has fulfilled a need for temporary (male) urinals to cater for weekend drinking crowds in major city centres. 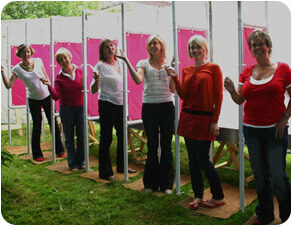 A trailer urinal has been used for the Big Day Out festival in Melbourne, allowing 8 women to stand in front of a wall-mounted urinal with a sop to privacy in the form of fixed vertical dividers. The design of the SheWee-inal® urinal and its associated She-pee enclosure addresses those issues in a number of ways. A set of generous privacy partitions can be configured in front of a low-level trough to make for individual booths, each partition screening the person’s body from about 1 metre to 1.7 metre off the ground, and to a depth of 0.5 metre. They can be spaced as required, normally 0.7 metre apart. The potentially intimidating vertical wet panel of traditional wall-mounted male urinals has been raked back to reduced spray. That and the wide trough allow the practice of squatting, although such is not recommended!